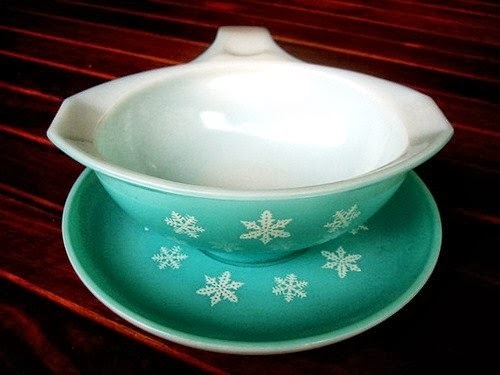 Farm Girl Pink....: ~ Turquoise Pyrex - JAJ Pyrex - Snowflakes!! Ever since I came across that Pink Pyrex daisy gravy boat... 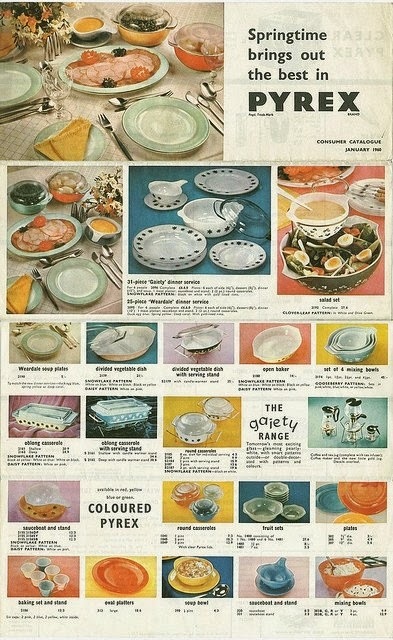 I have been a looking at the older Pyrex advertisements. Wondering if they may have been issued in the US. Though not in that fabulous pink daisy pattern. But maybe in solid colors or something. And in the lower bottom corner you can see the gravy boat and saucer in solid blue. With a couple other ones scatter on the page. Then of course, I saw another incredible colored gravy boat. This time in turquoise... and it hurts my soul, to know these were never issued in the US. It was bad enough to know, that there was a pink daisy one out there.... but this just double's down on my pain... to see one in turquoise too. I've only ever seen the white & black snowflake gravy boat in person. I'd own one of the beautiful colours if I saw them! & I think the ad is for JAJ? The top one looks like the off white & black gravy boat, doesn't it? & the baking cups under that are similar to JAJ ones & that platter is like a gravy boat from JAJ. JAJ produced such pretty patterns. At this point I just want one in any color. I am still slightly miffed that I have never seen one of these in person. And I am not convinced that these lovely gravy bowls were released in the US.